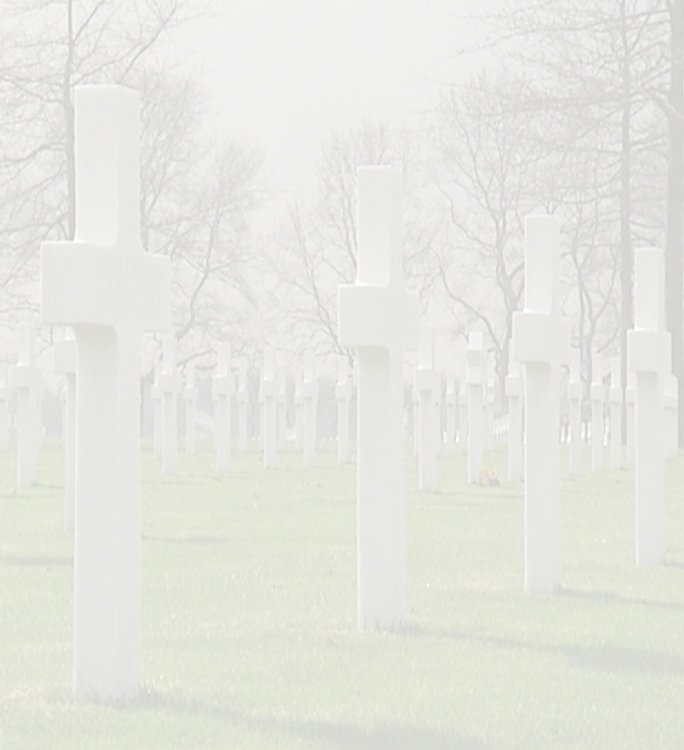 This is the story of a young U.S. soldier who made the ultimate sacrifice for our freedom in Europe. John Frankovitz was born in Mckeesport, Pennsylvania, he was the second son born to Bozo Frankovitz and his wife Victoria. His parents were born in (former)Yugoslavia and immigrated with their oldest son to the United States in 1907. 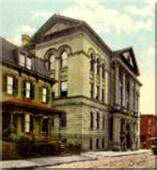 The Frankovitz family settled in McKeesport in Allegheny County. 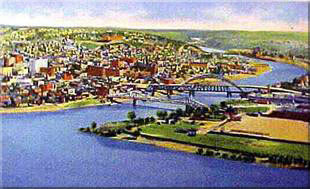 John (born 9 December 1920) and his younger brother (born June 1925) were raised in McKeesport. 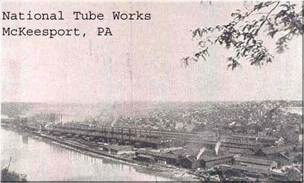 Father Bozo Frankovitz worked as a labourer in a tube mill in McKeesport, Pennsylvania. 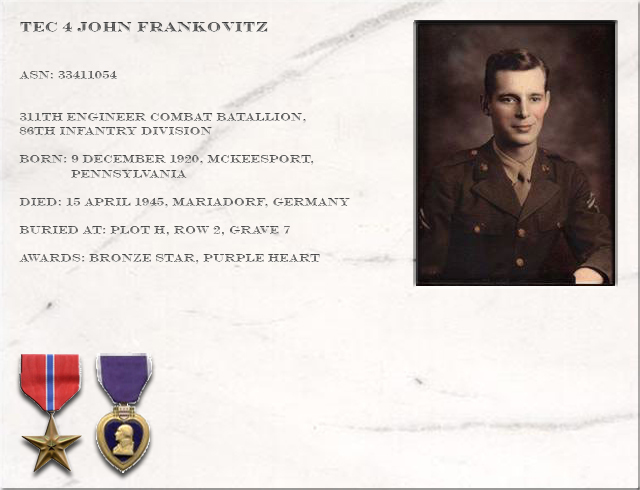 John Frankovitz graduated from high school and worked in machine shops and similar occupations before the war. John Frankovitz’s religion was Catholic, a Bible was found in his possessions. John enlisted in the United States Army, February 3,1943 in Erie County, Pennsylvania. He was a member of the 311th Engineer Combat Battalion of the 86th Infantry Division. John probably went to Camp Howze in Texas for his Engineer training. The primary mission of Combat Engineers is to KEEP THE ARMIES MOVING TO ATTACK, AND IMPEDING THE ENEMY. 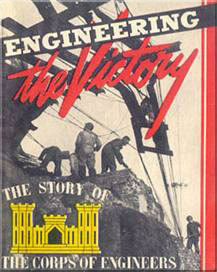 • Bridge (mobile, floating, fixed), rail, & road construction, maintenance and yes, destruction/demolition! After Louisiana manoeuvres in 1943, the 86th trained at Camp Livingston, Louisiana, (near Alexandria) before transfer in September, 1944, to 3 camps in California - Camp Cooke (Near Lompoc - now Vandenberg Air Force Base), Camp San Luis Obispo and Camp Callen (near La Jolla) - to prepare for combat in the Pacific. During this period, in December 1944, the War Department decided that the 86th Division would be sent to Europe due to the serious situation which the Allied Forces found themselves in the Ardennes front in Belgium. Consequently, in January, 1945, the 86th Infantry Division made preparation for movement to the east coast for embarkation to Europe planned for February, 1945. Before sailing to Europe the Division was stationed for a few days at Camp Myles Standish (near Boston) prior to embarkation. 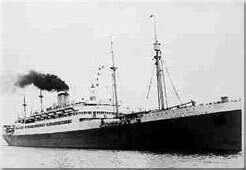 The 86th Infantry Division sailed out of Boston on February 19,1945,and eventually joined a convoy of over 60 ships crossing the Atlantic Ocean. Although German Submarines were believed sighted and depth charges were fired, no ships were torpedoed. (formerly the SS Kingsholm)and the USS Edmund B.Alexander. (341 Inf.). The 86 Infantry Division, nicknamed: the Black Hawks arrived safely at Le Havre,France on March 3,1945.They were trucked to camp Old Gold, near Doudeville, France. At this time the 86th Infantry Division was composed of the 341st,342nd,and 343rd Infantry Regiments; the 331st,332nd and 911th Field Artillery Battalions (105 mm Howitzer);the 404th Field Artillery (155 mm Howitzer),the 311th Engineer Combat Battalion, the 86th Cavalry Reconnaissance Troop (Mechanized),and various Combat service support units. 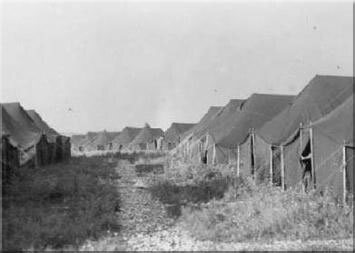 At Camp Gold the companies were trained in street fighting, hand to hand fighting, test fired all crew-served weapons, trained Infantry crews in assault boat crossings. On March 22,1945, the Black Hawks were alerted and ordered to join the newly formed 15th Army. ACTION AGAINST ENEMY REPORTS 311th ENGINEER COMBAT BATTALION. On motor march from Camp Old Gold to Badorf Germany. Stops made at two hours intervals. western outskirts of Cologne to Badorf. Total distance travelled 365 miles. March made at average speed of 25 to 30 mph. 311th Engineer Combat Battalion took positions in vicinity of Badorf Germany for defence and counterattack of area along Rhine river between Warringen and Grau Rhiendorf. During the night the Black Hawks relieved the 81th Infantry Division and assumed its mission of defending the west bank of the Rhine. This 23 mile front, was from north of Cologne to the vicinity of Bonn. The Division continued in the performance of this mission for the next 8 days. During that time they took part in artillery duels ,gave and received small arms fire, and turned back probes by German patrols to the German Side of the river. On April 5, at 1600hr. General Melasky was notified by 15the Army, that the 86th Division had been assigned to the XVIII Airborne Corps, of the US 1st Army, and that the Division was to leave immediately to an assembly area in the First Army sector. On April 6, 1945, the 86th Infantry Division spearheaded the attack against the German forces in the Ruhr Pocket. The 86th made an end run down the flank of the Ruhr Pocket, then cut left, splitting the German forces and linking up with elements of the 9th Army. During this attack, the 86th captured the major cities of Attendorn, Lüdenscheid and Hagen, effectively ending further attack by the German forces. This was attributed to the fact that the 86th had successfully maintained the tactical advantage of speed and manoeuvre throughout the assault. Had the attack been initiated with less speed and determination, it is quite possible that the Germans could have bolstered their defensive positions on the flank and held the 86th at bay for at least three to six more days which would definitely have resulted in higher Blackhawk casualties. The 86th Infantry Division, during this period, consisted of the 341st, 342nd and 343rd Infantry Regiments. In support of the Infantry regiments was the 86th Division Artillery consisting of the 331st, 332nd, 404th and 911th Field Artillery Battalions. Combat service support was provided by the 86th Signal Company, 786 Ordinance Company, 86th Quartermaster Company, 86th Reconnaissance Troop, 311th Engineer Combat Battalion, 311th Medical Battalion and the 86th Counter-Intelligence Corps Detachment.